During my Egypt trip, they asked if I could do something different during my show. This being my 6th trip in 2 years meant they had seen all my stuff. Now we needed something new…It was time for the revival of the 6 foot balloon! The what? 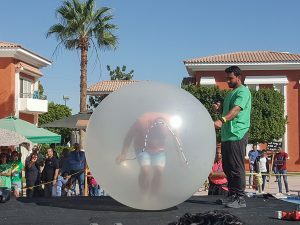 Years back, and I mean like 20, I was the 2nd (or 3rd) person in the USA to learn how to perform with a giant 6 foot balloon. The basic premise was to climb inside it and then back out. It was an odd thing that no one had really seen before. Outside of a cheesy used car dealer, where on earth do you see a giant balloon? If you were at one of my shows, you not only got to see one, you got to watch me climb inside and jump rope with it. Fast forward a couple years and I was really getting tired of doing this routine. Initially I could use the same balloon for 8 or 9 shows before it popped on me. By the end, I was going through 2-3 balloons per show. Not only were they expensive, but it took up a bunch of time that I really didn’t have to waste in my show. 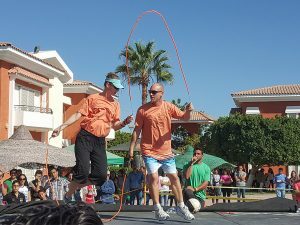 Plus, out of all the things I did, this was the least skilled part of my jump rope show. I also found out that numerous other people had started doing the balloon in their shows and I decided it was time to retire it from my act. This was around 2004. I had a couple venues specifically request the balloon from time to time, but the last time I remember doing it was 2006. When the crew from Egypt asked if I could do something different, I knew the balloon fit the bill. No one over there had ever seen it as far as I could tell. I also knew that for an outdoor event with a lot of transient people, it would really make people stop and watch. Boy did they. There were a couple issues during my show with the underwater jump roping. The balloon routine also had some issues that needed to be dealt with. The first problem was how to blow the thing up. The most effective way to blow one of these things up is with a leaf blower. They are designed to blow a lot of air in a very short amount of time. Egypt doesn’t really have that many leaves. Where was I going to get one? The event coordinator promised me that they had one, but I’m always skeptical until I see proof. When I arrived on site they said they would go get it. It ended up taking a couple hours to find the thing so I’m glad we didn’t wait until right before the show started. When they finally showed up with the thing it was powered by a small battery (which was another worry averted…gas powered is a no go since I would be breathing the air inside). It wasn’t as powerful as the ones I am used to, but it ended up working, even if it took a while to blow up all the way. The second issue we ran into was the stage itself. It was made out of plywood that had been screwed together. This was fine for jumping, but had some very sharp protruding spots that would wreck havoc on a giant balloon. We found some carpet that would be rolled out for this one part of the show. The majority of shows I do are indoors. I have no problem with performing outside, but generally prefer an indoor venue if I have the choice. I hadn’t really planned on the wind being so strong. I’ve learned to deal with how the wind affects my jump ropes. It’s hard to remember if I ever did the balloon outside before. I almost fell off the stage during the second show! Thankfully my translator was very watchful and he was quick to steady the back side of the balloon when he saw it pushing me backward. Once inside the balloon I decided that I wanted to try jump roping. Back in the day I would bring my upper body out of the balloon before I would jump. The new balloons that I had purchased were clear so people could see me while I was inside. I had to try jumping rope while I was inside! This worked out pretty well. We did find that if we added too much air back into the balloon then it would pop. I would have preferred to stand up more while jumping, but found that it worked just fine if I was crouched down a bit. The crowds seemed to really love this odd ball turn of events. We had a massive crowd that stuck around for the entire program. I don’t plan to add this back into many shows, but I do have it in my repertoire if the situation demands something out of the ordinary!